When working in Excel with combo boxes, from the Forms toolbar, this Excel add-in can save many hours and prevent unnecessary errors. After selecting a range of cells, contiguous or non-contiguous, a specified number of combo boxes can be added to the worksheet in just a few clicks. All cell links, names, input ranges and much more can be set in one step. A new menu item is added to the Forms Toolbar once the Combo Box Wizard Add-in for Excel is installed. Adding Combo Boxes - All combo boxes are added to the cells selected at the time of running the Combo Box Wizard. All selected cells are shown in the 'All Combo Boxes will be added to selected cell(s)' box. Non-contiguous cells can be selected by holding down the Ctrl key (before launching the Combo Box Wizard). Cell Link - Returns the number of the item that's chosen from the combo box (the first item in the list is always 1). This number can be used in a formula or VBA macro to return the actual item from the input range (range that is used to populated the list). Cell Link Offset - If a combo box is added to Cells A1:A10 and used a Row Offset of 0 and a Column Offset of 1 the Cell Link for each Combo added would be B1:B10 respectively. Conversely, if a combo box was added to Cells B1:B10 and used a Row Offset of 0 and a Column Offset of -1 the Cell Link for each Combo added would be A1:A10 respectively. If a Cell Link is not possible (cannot offset the specified Row and/or Column) a cell comment will be added to the cell housing the combo box. Input Range - These are the cells used to populate the combo boxes. Clicking the button to the right of the 'Input Range' box enables these cells to be selected. Drop Down Lines - This is the number of entries that will be shown to the user, when they click the combo box drop button, before a scroll bar is shown. Combo Box Sizes - The default size for all combo boxes added via the wizard is the same as that of the cell housing it. Clicking the 'Specify Size' button will force a specified size for all combo boxes. After clicking the 'Specify Size' the 'Make Same Size As Cell Housing it' checkbox can be unchecked to use the 'Width' and 'Height' spin buttons to specify a size. The Preview shows the size that will be applied. Print Combo Boxes With Worksheet - Checking this (default) will cause the combo boxes to show when the Worksheet is printed. Locked Combo Boxes When Worksheet Is Protected - Prevents combo boxes from being changed, moved, resized, or deleted. Locking objects has no effect unless the sheet is protected. Move But Don't Size With Cells - Checking this (default) will cause the combo boxes to move with the cell housing it, but resize if the cells Row height or Column Width is changed. Don't Move Or Size With Cells - Checking this will cause the combo boxes to not move with the cell housing it or resize if the cells Row height or Column Width is changed. 3D Shading - This will give the combo box a 3 dimensional visual effect. Allow Me To Name Each Combo Box - Checking this option will cause the Combo Box Wizard to prompt for a name as each Combo Box is added. The default text will be the default name that would otherwise be used. Naming combo boxes is of use if they are to be referenced within VBA code or if they are to be chosen for deletion at some stage. Delete Combo Boxes - Will delete all chosen combo boxes on the current sheet. 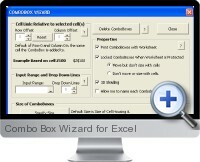 Built In Help - Outlines how to use the features of the Combo Box Wizard Add-in for Excel.